Categories: Combo Kits, Power and Hand Tools, Power Tools, Tools and Home Improvement. The DEWALT DCK955X XRP 9-tool combo kit comes with almost everything you will need to get working on your DIY projects, or professional contracting jobs. Featuring nine different tools and a handfull of accessories, the DCK955X comes with two contractor bags so you can hold all the tools the kit has to offer. The DCD950 18-volt XRP hammerdrill has a patented, three-speed transmission that matches each speed to the appropriate application, offering professional end users maximum performance for various applications. For example, the first speed is ideal for drilling large holes in wood, using large diameter hole saws and self-feed bits. The second speed is ideal for use with auger bits and step bits, while the third speed is most commonly used for fastening and hammer drilling into concrete. The speed shifting control is now positioned front to back and has positive detent stops allowing users to easily shift between various speeds. Additionally, the drill has a two-collar design that enables users to quickly transition between drilling, screwdriving and hammer drilling modes without changing the clutch setting. The DCD950 18-volt XRP hammerdrill is built with a high-power, high-efficiency frameless motor that delivers increased performance for drilling and fastening applications. It is also equipped with an exclusive chuck that self-tightens throughout the application to prevent bits from slipping. The chuck is designed with twice the bit holding strength of traditional ratcheting chucks. Additionally, this hammerdrill has 30 percent more runtime than previous XRP drills due to the optimized frameless motor and patented three-speed transmission, enabling the drill to operate more efficiently. The DC390 18-volt circular saw with 6-1/2-inch carbide blade can cut a 2×4 at a 45 degree angle in a single pass. The DC385 18-volt cordless reciprocating saw with keyless blade clamp allows for quick blade change without having to touch the blade or reciprocating shaft. The DC825 impact driver is ideal for steel framers, commercial electricians, cabinet installers, deck builders, HVAC, and wet and dry mechanical contractors who need a compact tool for self-drilling metal screws, setting wood and lag screws, spade bit drilling of up to 1-inch, and a wide range of nut/bolt combinations. The impact driver is equipped with a high-speed frameless motor with replaceable brushes, providing users with high performance, durability and serviceability. The frameless motor design benefits from increased airflow and provides more power, enabling users to complete a wide range of fastening applications. Additionally, the DC825 has a reduced overall length and tool footprint, creating a compact, lightweight tool that allows users to access tighter areas and easily complete overhead applications. The DC825 impact driver has an improved variable speed reversing switch, providing users with more control for both setting and removing fasteners. In additiona, a textured anti-slip comfort grip handle design delivers increased comfort for extended use. The bright LED work light offers additional visibility in dark, confined spaces, and for increased user flexibility and productivity, the impact driver has an OEM accessory recess that provides compatibility with many popular after-market components. This 18-volt model is powered by the DEWALT 18-volt cordless system, which provides users with superior cycle life and runtime. The DW059 18-volt 1/2-inch high torque impact wrench can put out 300 ft-per-pound of maximum torque. The DC330 19-volt variable speed jig saw with all metal lever action has a keyless blade change for quick and easy use. The DC411 18-volt cut-off tool with up to 6,500 revolutions-per-minute, provides high power for cutting and grinding applications. The DC550 18-volt cut-out tool comes with a tool-free bit change. This allows for quick bit changes, making it flexible enough for any situation. The DW919 18-volt flexible floodlight provides hands-free use. The floodlights provides the additional lighting you will need to get to work in those dark, confined spaces. The DEWALT DCK955X XRP 9-tool combo kit comes with one DCD950 18-volt XRP 1/2-inch hammerdrill, one DC390 18-volt 6-1/2-inch circular saw, one DC385 18-volt reciprocating saw, one DW059 18-volt 1/2-inch high torque impact wrench, one DC825 18-volt 1/4-inch impact driver, one DC330 18-volt jig saw, one DC411 18-volt cut-off tool, one DC550 18-volt cut-out tool, one DW919 flexible floodlight, two 18-volt XRP batteries, one 1-hour charger, one 360-degree side handle, one carbide tipped blade, one type-1 guard and wheel, one wrench, one backing flange, one 2-position side handle and two contractor bags. 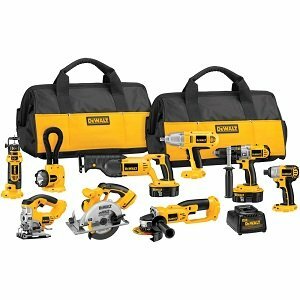 The kit is backed by DEWALT’s 90-day money-back guarantee, a full one-year service contract, and a three-year limited warranty. DCD950 XRP 18-volt cordless hammerdrill with patented 3-speed all-metal transmission and 1/2-inch self-tightening chuck delivers 450 units watts out of maximum performance.